The latest issue of the new university extension diploma offered by the Valencia Polytechnic will begin on the 19th of October. The extension diploma in textile applications teaches the student about the exciting possibilities offered by textiles in technical markets which are an emerging sector of application. 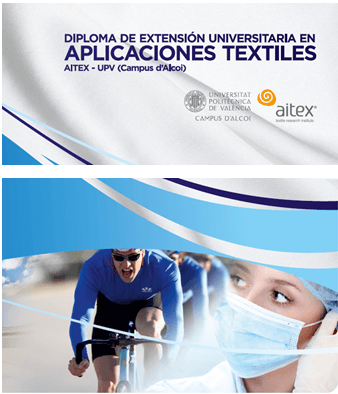 The diploma enables the student to work in the field of textile manufacturing from the perspective of innovation. The knowledge the student gains during the course is designed to aid their efforts as innovators as well as teaching about existing legislation and the requirements of these emerging markets and products. The highly-specialised teaching staff come from the partners – the Valencia Polytechnic, Alcoy and from AITEX. The course lasts 300 teaching hours (30 credits). The diploma course is taught in two blocks: a distance learning component (70% of the teaching hours) and an attended component (30% of the teaching hours) taught at the UPV in Alcoy and AITEX, during the weekdays. The diploma offers the student the chance of gaining work experience at textile and garment manufacturing companies during the course.